Hello , this time I would like to announce Exclusive Birthday Gifts for SCforum members, provided by our partner Company - DIGIARTY. World's NO.1 Fast Ultra HD Video Converter - Convert 4K/HD MP4 AVI MKV in a Flash. WinX HD Video Converter Deluxe, all-in-one video software as an Ultra HD video converter, online (YouTube) video downloader, slideshow maker and video editor, gives you an ultimate control over any HD, SD and 4K resolution video files on your PC. With hardware acceleration tech, it enables multiple CPU cores to simultaneously use QSV and CUDA/NVENC to encode and decode videos, which helps you convert video in a flash! 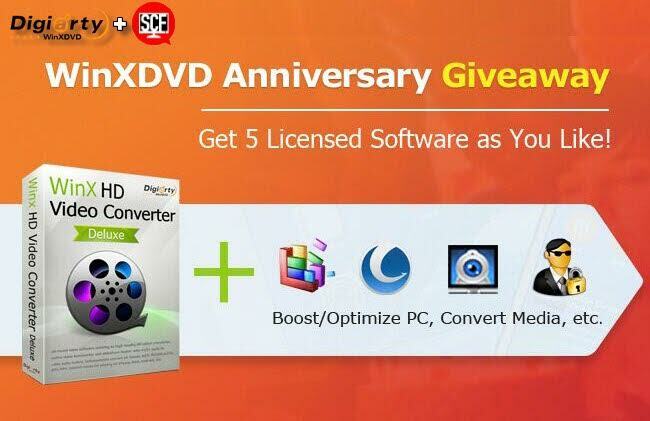 This video converter software perfectly supports 1080p multi-track high definition videos MKV, H.265, AVCHD, MOD, M2TS, Blu-ray videos, HD camcorder videos, and standard AVI, MPEG, MP4, VOB, MOV, FLV, WMV, RMVB, WebM, Google TV, etc. It has 410+ built-in preset device profiles to convert SD/HD videos for playing on Apple (iPhone, iPod, iPad, iTunes, Apple TV), Android (Samsung, HTC, Nexus, Kindle Fire), Microsoft (Xbox, Windows Phone, Surface), Sony, Chromecast, Nokia Lumia, etc on the journey. To get these Great Apps for FREE (regular price is $170)... You don't need to do almost anything! You're welcome Pal & also, Thanks for sharing. By the way, I'm really happy to see one of our oldest VIP members online again ... as I see, your last post is dated in 2013.
will try to be regular now..